My kids got a kick out of this: Mario (of Nintendo Super Mario fame) is named after a real man. Segale unwittingly stepped into video game history by renting out a warehouse that served as Nintendo’s U.S. headquarters in the early 1980s. At that time, a financially struggling Nintendo of America (NOA) was preparing the U.S. launch of Donkey Kong. Legend has it that NOA President Minoru Arakawa noticed physical similarities between Donkey Kong’s short, dark-haired protagonist and the landlord. So the crew at NOA nicknamed the character Mario, and it stuck. 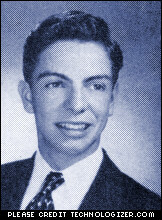 Mario Segale in his 1952 high school yearbook photo. So what does Segale think of his name being used for a game that has sold more than 100 million copies and made Nintendo one of the world’s most profitable companies, not to mention the Super Mario Bros. movie just released? “You might say I’m still waiting for my royalty checks,” he quips. This entry was posted in gaming, kids and tagged gaming, kids, Mario Segale, Nintendo, Super Mario. Bookmark the permalink.